You will be sent a confirmation email, upon verifying your sign up, you will be sent another email with the link to the free chart. What a blessing this design has been! 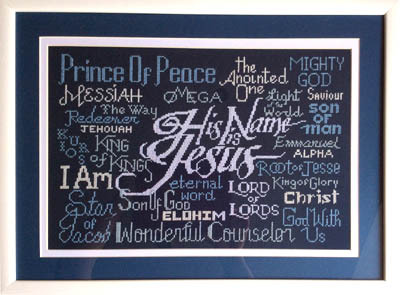 His Name is Jesus is available at twice the size, perfect for a church foyer or large wall. 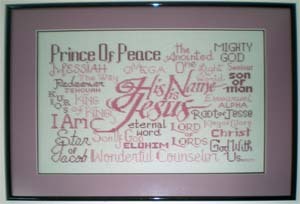 You may also like the complimentary designs Holy Spirit and Jehovah to complete the Trinity. Stitch the Trinity in Spanish, Su Nombre es Jesús, Jehová Señor and Espíritu Santo. 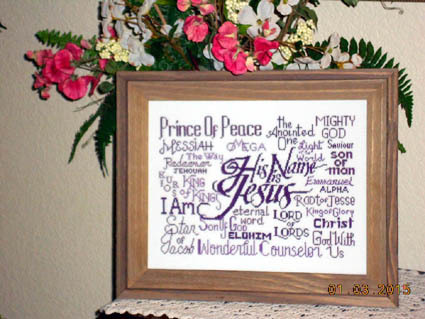 Customer Comments and Photos regarding the Free Design "His Name is Jesus"
I would love to share these beautiful renditions of the "Names of Jesus" which my friend Bev Van Vuuren has done. She is so talented and so humble, doesn't like to make a fuss over her work. 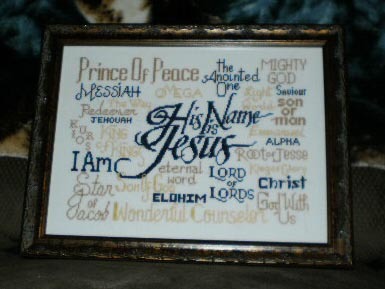 I would love them to be displayed on the website, especially as she gifts them to friends, churches and pastors. God bless you and your team this Christmas season. 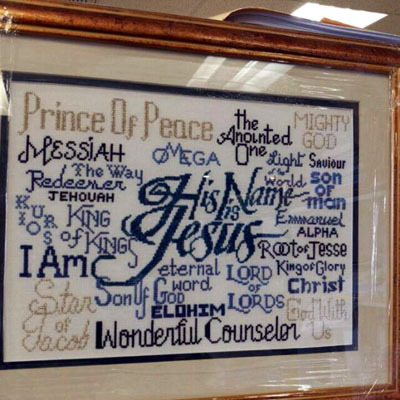 Don't have the time to stitch His Name is Jesus? 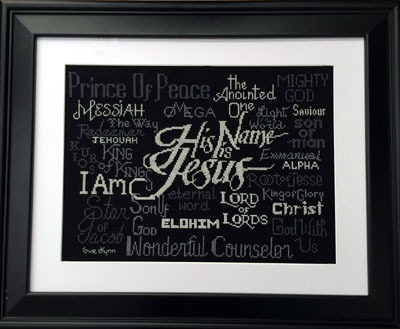 Contact Vicki Giger at her Etsy Shop called My Stitching Corner, she will be glad to stitch not only His Name is Jesus", but any of the Name Blessings designs. 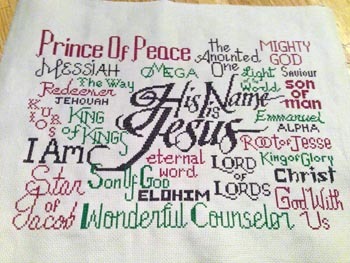 Diane Higdon stitched all four of the below. 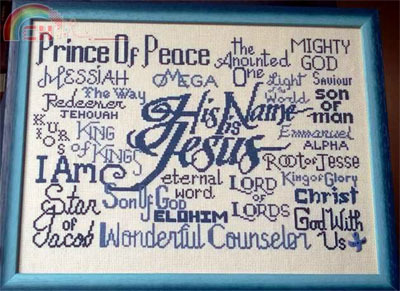 I had just shared with my husband that I wanted to do one of those cross stitches with all the names of Christ in in beautiful colors etc. and I said I will look it up.. and you offered it FREE!!!!! Thank you from my heart.. 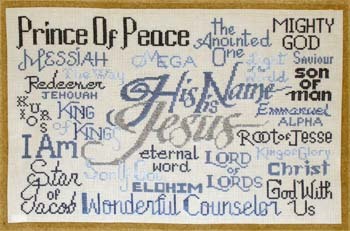 I love that special one, I have several others and books of biblical cross stitches but that one was so sweet. God bless you for being a blessing to me and others. I used basic black aida cloth 12 ct. using stark white as primary color then two shades of coordinating gray's for other 2 colors. I really loved every minute stitching this pattern which will be given to my mother-in-law for Mother's Day. Just a thank you again for this lovely chart. 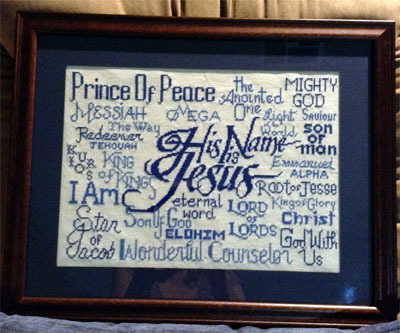 I finished stitching it this past week and framed it today. I will be giving it to my mother for Easter. 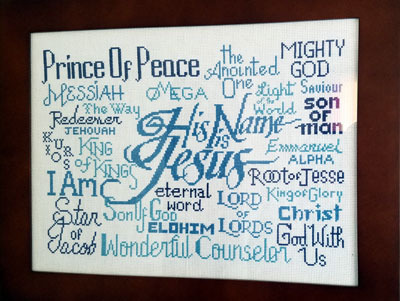 I love the "His Name is Jesus" pattern, and recently finished my first one as a housewarming gift. 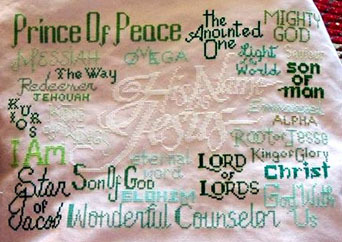 The friends I stitched it for have gray walls in their house, so I did it in bright pink, blue, and green to stand out. 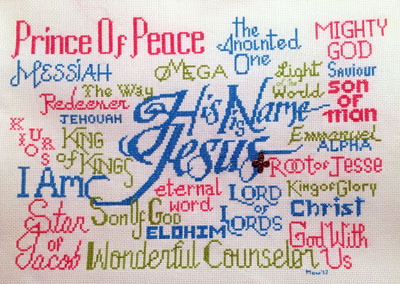 Thank you for sharing and I look forward to stitching many more! 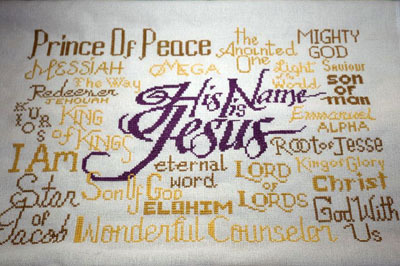 Donna Graves stitched this in DMC 208, 327, 333 and 552 for the purple tones and 783 for the gold. Donna used 4 shades of varigated purple along with gold filament for this finish. 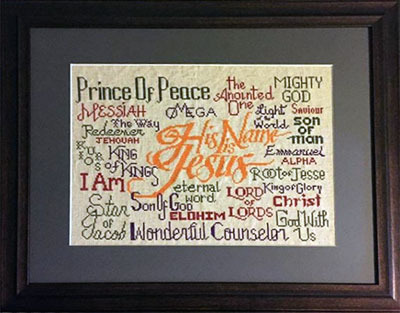 Donna Graves with His Name is Jesus stitched with DMC 498 and Gold Filament. 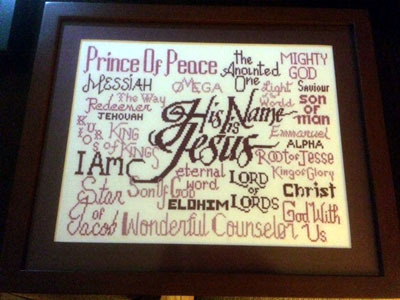 This was given to a friend as a Christmas gift. 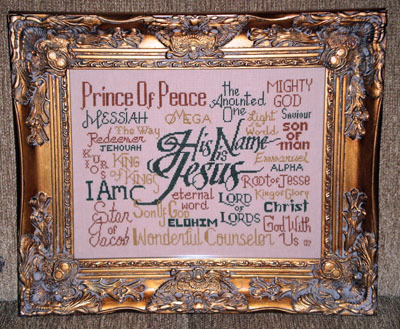 The frames were purchased at an estate sale so are one of a kind and quite old. 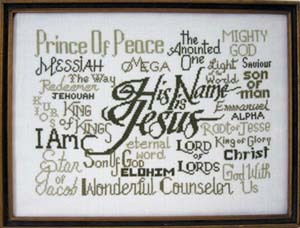 I just finished a 6 week study on Jesus and another study on the I AM statements. 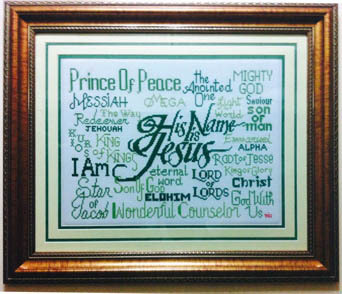 Doing this needlework helped me to meditate on my Lord Jesus. 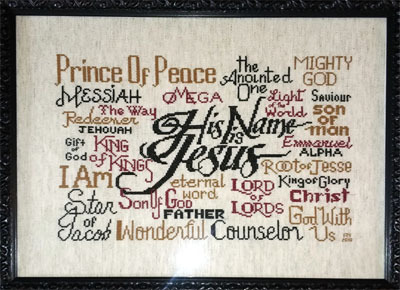 I just completed the "His name is Jesus" cross stitch! My first big project! And I LOVE IT!! I will be giving it to my parents (who are evangelists) for Christmas. Thank you SO much for making this pattern available! I just wanted to say thank you for so many inspirational charts to choose from. 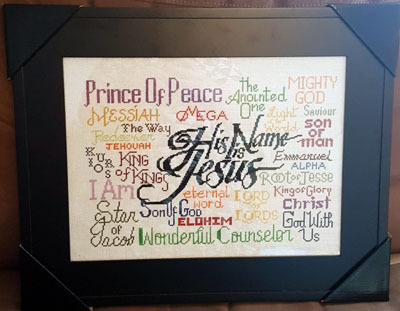 Of course my favourite is 'His Name is Jesus'. I have done two, one in blue and one in mauve. I also completed your little Christmas Trio. Currently I am working to finish the 1Cross3Nails4Given bookmark. 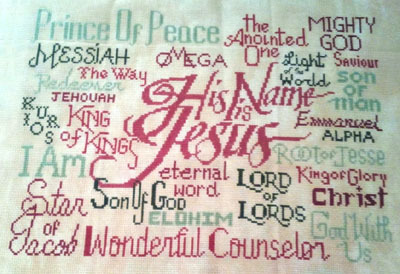 I have stitched 13 so far as I am going to give them to the ladies of my weekly Bible Study when we start back in September. 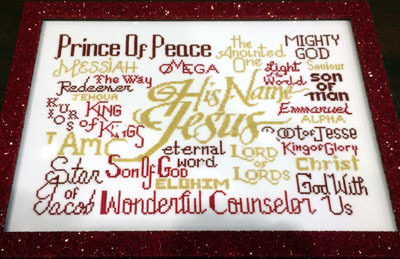 I have also started the 'Holy Spirit' chart and am doing it in shades of Red/Burgundy. Looking forward to stitching more!! God Bless. 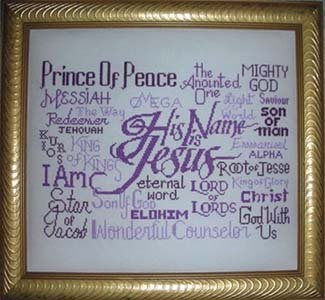 For 'His Name is Jesus' I used the blue tones DMC 311, 312 and 322 and the mauve/purple tones were DMC 550, 552 and 553. I would be honored for you to post my picture to your website. Another tidbit I wanted to share with you as well. and gave a lesson on how to cross stitch. They did a small ladybug and have started other projects since. and teach them or anyone else that would want to learn. I enjoy your website and also purchased one of the scarfs. I would be honored to have my work displayed. 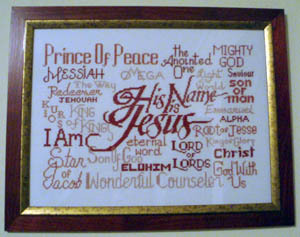 All the pieces I do are gifted and primarily scripture or God related. I enjoy being able to spend hours praying over my pieces and the person they're for as I work. 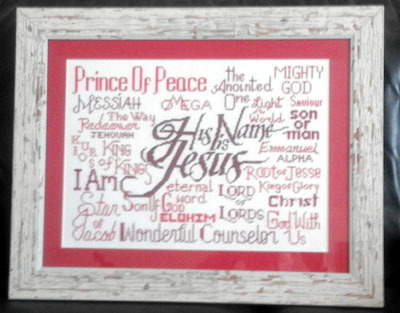 Professionally framed in a red glitter finish frame. The silk and the glitter gave a stunning effect. Special note- I found the Gloriana Silk beautiful but a bit difficult to work with so patience is required. I used DMC 3834 for the center and then used DMC 725 for the dark color, 3820 for the very dark color, and 3829 for the medium dark color. 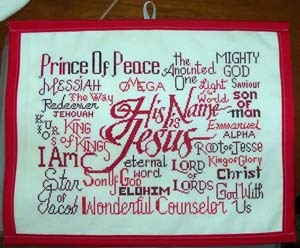 It really was a joy to stitch and I do have plans on stitching it again in different colors. Both stitched by Mary Acosta. She looked up the the floss colors used for the brown tones version, they were 310, 435 and 610. I loved stitching this pattern. It bought me peace with every stitch. 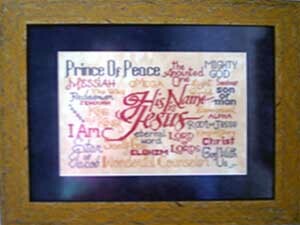 I donated this at a silent auction to some friends who were raising money to go to serve in Peru as missionaries. The wife's mom won it! I was so excited for Laura & her mom! I apologize that there are reflections on my pictures. It seemed that no matter where I placed the frame I had shadows and reflections. I appreciate your offer of a free chart in exchange for sending a picture of a completed one. I'd like to have the Holy Spirit chart, please. Good afternoon!! 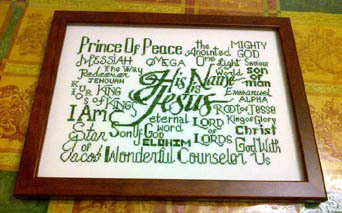 I would like to submit my photo of "His Name is Jesus" as a completed Joyful Expressions design. I personalized it with my name & date. I absolutely loved stitching this piece for what it means to me & my family, for the colors I chose and for the simplicity. Thank you so much for this piece. 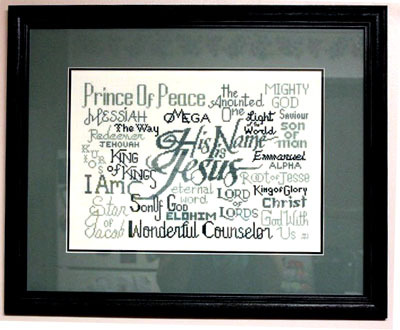 I saw "Holy Spirit" and would LOVE to have that chart as a complementary piece, if possible. Again, I thank you very much and hope you have a blessed day!! I feel honored that you would want to post the photo. I can't remember exactly the floss colors I used; I think they were 3834, 3835 and 3836. Just gave it to my friend and she loved it. DMC 783, 815, 304 on 28ct Mello from Picture This Plus. Thanks for liking my page as well. I would be honored to have this posted on Joyful Expressions wall of fame. I will try and have this framed within the next two weeks. I really loved every minute stitching this pattern which will be given to my mother-in-law for Mother's Day. This is why I chose to do the pattern in purple, The color purple has been associated with royalty, power and wealth for centuries. In fact, Queen Elizabeth I forbad anyone except close members of the royal family to wear it. Purple's elite status stems from the rarity and cost of the dye originally used to produce it. And because my Lord is royalty above all other royalty I thought it fitting to do the pattern in purple. Floss colors used were DMC 550, 553 and 554. This was for a friend at The Salvation Army they had moved away. 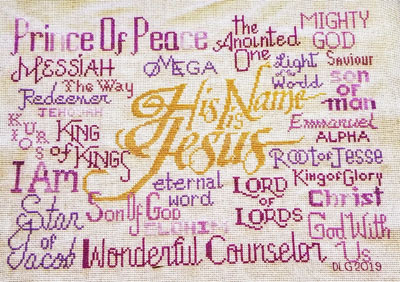 His Name is Jesus stitched by Trish Estes. 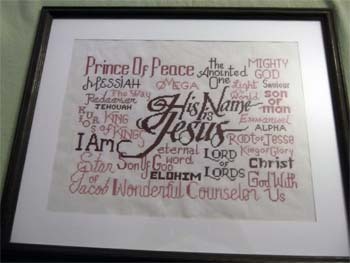 His Name is Jesus stitched by Kama M.
I made this one (quite a few years ago)in a different way for my dad. It was a little smaller and a little bit faster than the original. 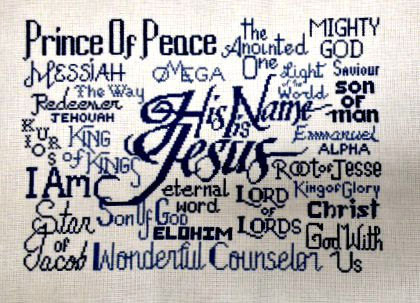 Thank you for the free pattern of His Name is Jesus. 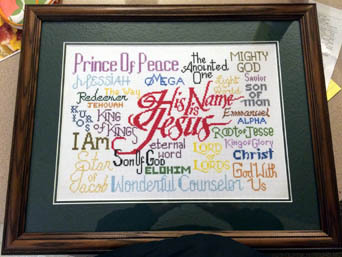 I made it for a family member that had graduated college and was headed to Seminary. He loved it. 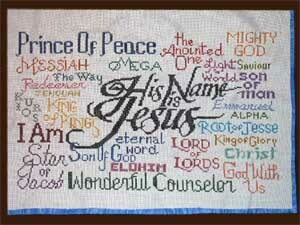 I have stitched His Name is Jesus 5 times, one for us and one for each of our 4 daughters' families. At my husband's urging, I entered this into the Georgia National Fair held in Perry, Georgia. My latest finish. 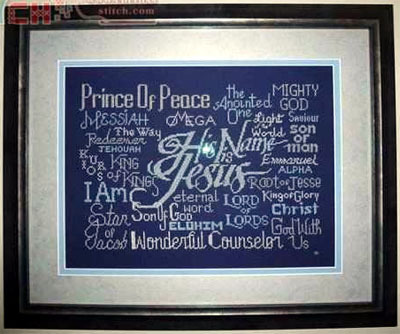 Matted by a professional and a Walmart frame. We live in Mexico City and serve in a church if Ex-pats who come for a couple to three years. I do these often as good-bye gifts. I did this one for a dear friend leaving, going to Belize. Here's the list of colors I used. This is my most recent picture I've made! 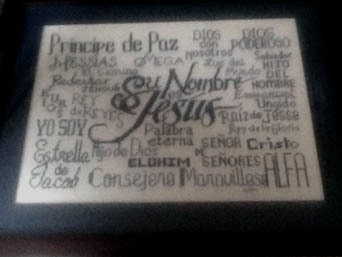 I gave it to my Pastor & his wife for their 20th anniversary being at our church AND the 100th anniversary of our church! Just thought I'd share this too! Thank you so much! Yes, you may post it! 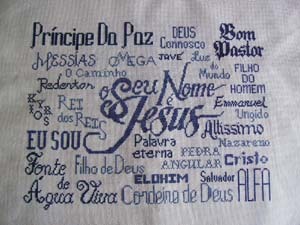 I love Jesus and I this pattern and sharing the stitching with others. 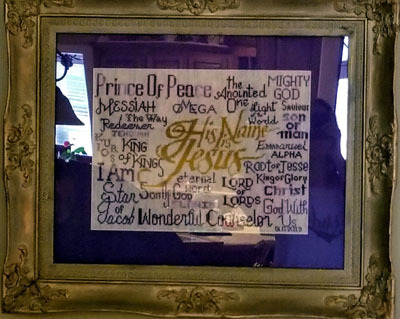 The frame was from Hobby Lobby. 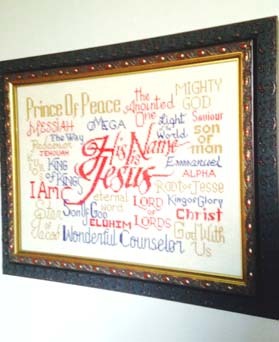 "New house with new decorations and this puts Jesus in the center of our home"
Finished my picture and it is so nice. Gave as a gift to a young man just ordained to the priesthood. 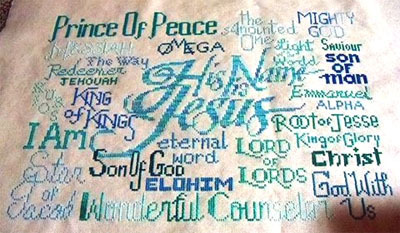 Patty stitched His Name is Jesus on light blue aida in the blue floss colors listed on the chart. 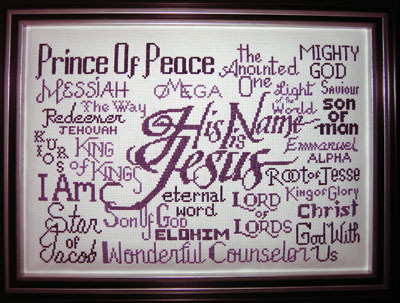 I got this cross stitch pattern online last year for FREE...I love it! 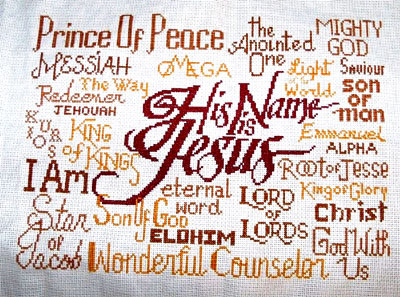 I can cross stitch and bless others with this wonderful "HIS NAME IS JESUS" picture! 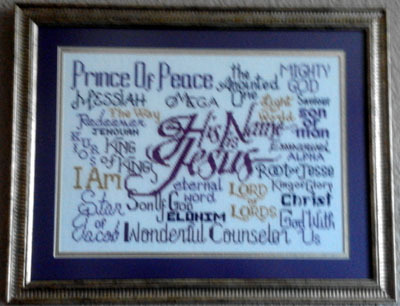 This one done in shades of purple (my favorite color) will live at my house after the fair! Used DMC 309 for His Name is Jesus and 304, 319, 368 and 321 for the rest. 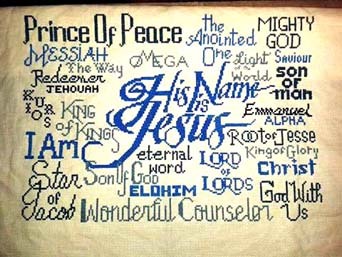 i love this chart and am looking forward to stitching others like it. I stitched this using our school colors. My name is Vicky Kempenski and I live in Bremond, TX. 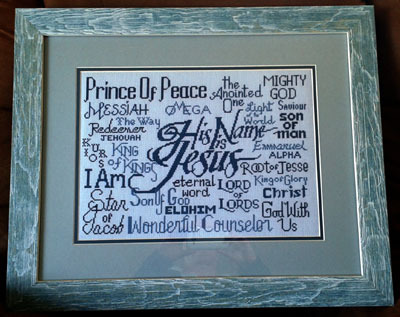 It was a gift stitched for my mother in law for Christmas last year. I am rubbing my hands in glee at the thought of a chart. I will go have a look at the website, there are so many I like, it will be hard to narrow it down. This for a lady who is having many struggles in her life right now. I cherish your friendship my dear friend. This one is going to a friend for her elderly sister. 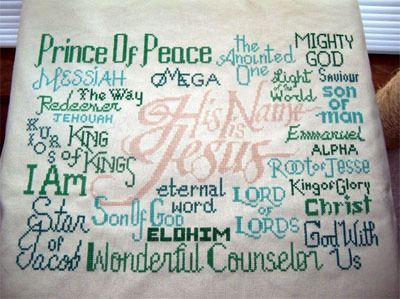 I want to share my beautiful Names of Jesus with you. 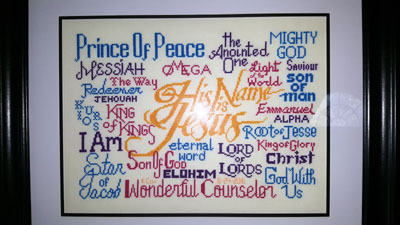 This chart has become a source of great joy to many in our Church as we are two ladies who have gifted 7 or 8 people with these pictures. Attached are two I have made, one was a gift to our newly wed pastor and his wife who left to minister in PE, and the other went to our senior pastor and his wife as a 50th Wedding anniversary Gift. This photo was sent in by Nanci Turner. 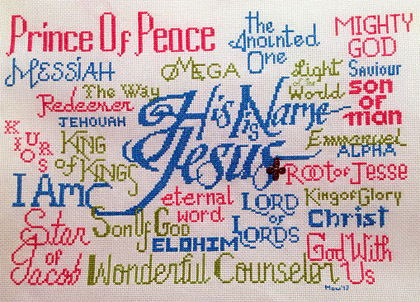 The day before I started a new Bible class an email friend sent me this pattern from your site. I liked it so much I put aside the pattern I was working on and started it. 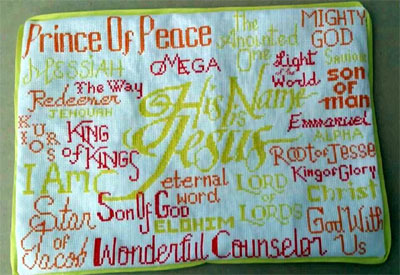 The first day in our study workbook the various names for God were drawn special attention to, so I decided to make the pattern and get it ready by the 7th week to give it to the Christmas bazaar being held at the church. 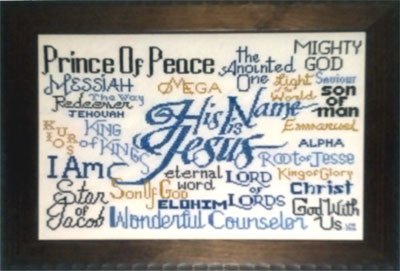 I did accomplish it and it has been given, and it certainly kept all the names for God in front of me during our study. I have done many, many hymns and prayers for others and have fund that while working on them, it is like praying for them each day. As you can imagine I am always looking for different charts for people. Thank you for your beautiful work. I have forwarded your site to many of my friends. I am so pleased to have discovered Joyful Expressions! 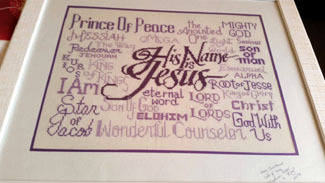 I have just completed 'His Name is Jesus', and have laminated it as a poster. I have stuck it on the back of a toilet door at my church where it will have a captive audience!! 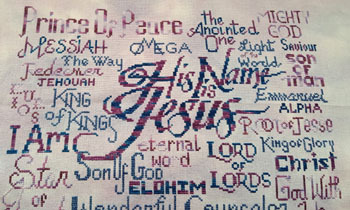 I stitched 'Jesus' with one thread of blue and one thread of silver, and slightly changed some of the recommended shades so that there is a variegated blue as well. It took me a week but I thoroughly enjoyed stitching it. Thank you for this wonderful free gift. 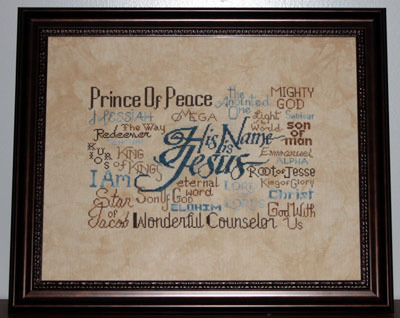 "Jesus is my King and Treasure." When I think of Him I think of royalty thus came the royal blue color and when I think of treasure I think of gold thus came the gold tones." I liked the original blues and pinks but these colors seem more masculine our Pastor is a male. Where your heart is there will be your treasure also. I really enjoyed getting back into my favorite hobby with this masterpiece. I take my cross stitching with me for waiting rooms, down time waiting on the kids, etc. and this particular one has been a natural segue into talking about my Christian faith in a subtle way. This is how I am and why. I know God has allowed me to be there when some seeds have been planted/watering thirsty seeds. Now I am sending it on to it's new home with my Mother-in-law and she'll be able to use it as well when folks visit her. I love it so much that after I finish the one for my Mom, I'll be making a 3rd one to hang in our home as well. I used DMC floss 311, 312 and 322. 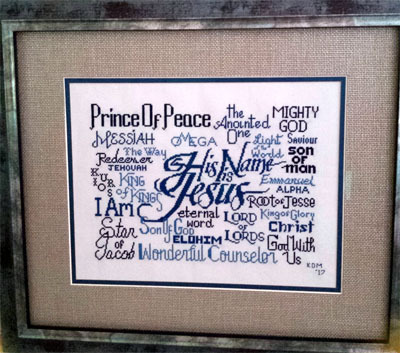 I honestly don't remember what the floss numbers were since I made this over a year ago, but it was a wedding gift, and my friends hung it over the fireplace in their bedroom. I used their favorite colors for the light and dark, with the medium being a nice mix of the two. Since I live in Wisconsin, I did wonder at first if it was going to look like it should be hung in Lambeau Field! I would be thrilled for you to display it on your website. When I cut the aida to the correct size I was a little daunted by how big it was! Nevertheless I entered in! 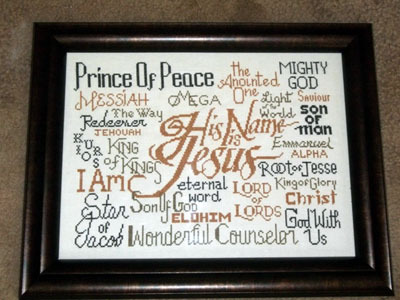 I really enjoyed working on the large version of HIS NAME IS JESUS. 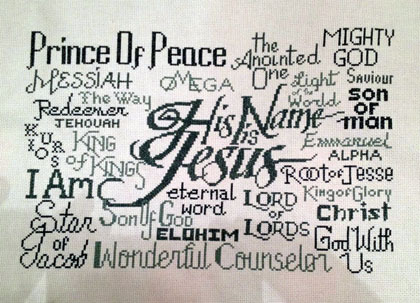 Different hymns and songs ran through my mind as I worked each name. I was amazed at the finished project. 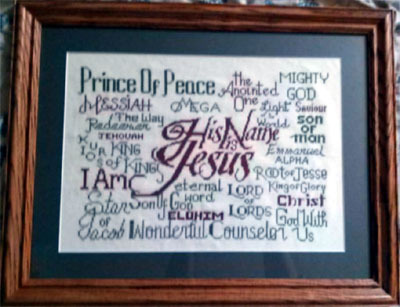 My local framers offered a discounted price as it was for a church. I am really looking forward to sharing it with my congregation tomorrow. Thank you for the offer of a chart. Do you have Job 23 vs 10-11? I couldn't find it. 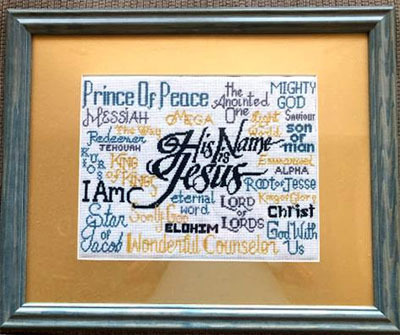 This is a cross stitch I had done for a service project my church was putting on. It was an auction to help pay for activities for the youth. I am going to eventually make one for myself. 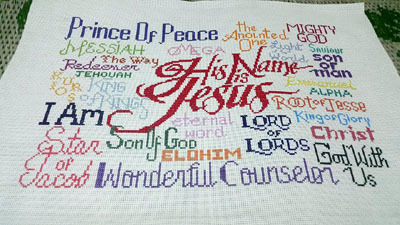 Thank you so much for the incredible pattern His Name is Jesus â€“ I have so thoroughly enjoyed stitching it and thought I would send you a picture of my finished work. In our church we have a ministry called the Pollyannaae ministry, whereby each year in November we have a luncheon and we hand out slips of paper where you write your name and other details, then you hand it all back in and they hand the papers out again. The name of the person who's slip of paper you pick is the person you will pray for and encourage through the year with little gifts, notes, letters etc. especially on special occasions. So you are PollyAnna to that particular lady and remain anonymous until the reveal at the year end luncheon. Its very special and very exciting to see how the Lord uses this ministry. When I saw this pattern I committed to make it for the lady I am PollyAnna to this year, and will be framing it and giving it to her at our year end function in November. Thank you for the blessing which I can pass on. 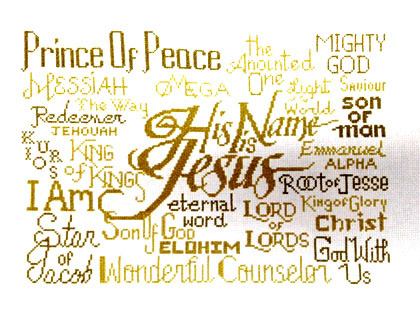 In the Name of Jesus and to His Glory. Well, I also knew I needed to change the colors to remove the strain from my eyes. 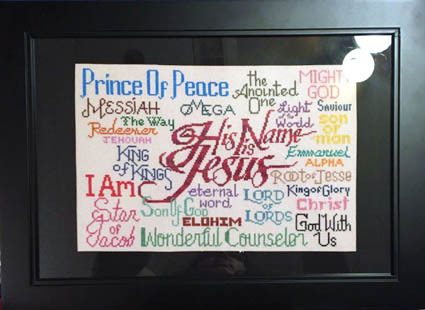 I wanted to use colors to represent Jesus. I chose red for His shed blood, blue for His royalty and gold for the promise of Heaven. They are also colors of the Tabernacle. I made mine. Then for several years I would make one a year and give as a gift...sometimes more than one a year. I have the bigger pattern and someday I will create it in the same colors. Why? Enjoyment, praise and gratitude from the heart for His indescribable gifts, worship, and anticipation of seeing HIs face someday! JOY! 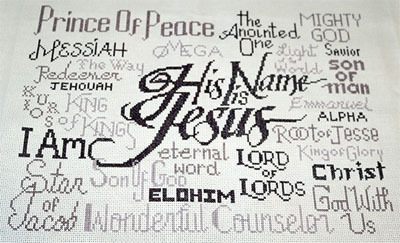 I am sending a finished cross stitch of the His Name is Jesus chart. I want each of my family members to have one eventually. This embroidery is a gift for my brother who this week June 2015 finished his university degree and graduated with honors. He worked and studied at the same time, not easy for a technical degree. He also became a believer in Jesus halfway during his studies. 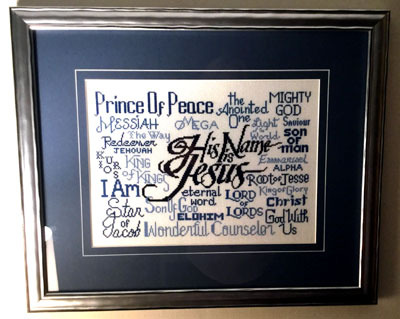 I started this project as a Christmas gift for my mom but after visiting my sister at a Christian recovery center in Mississippi (Jacob's Well in Poplarville) I decided to make it for her as she has renewed and deepened her relationship and love for the Lord. He has shown her so much and I praise him for it. Done for one of our deacons and his wife who have been such encouragers to us as pastors. 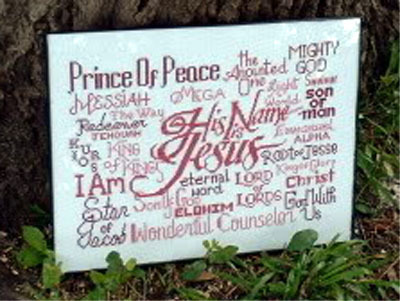 im writing to you to show appreciation and gratitude for making His Name is Jesus available for all. Attached is a photo of my finished project. 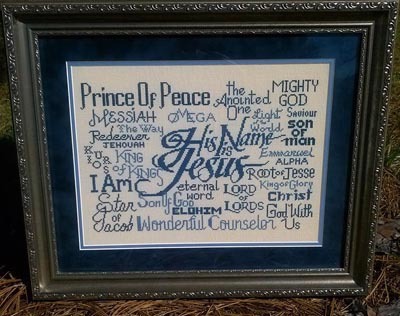 Anne has stitched numerous Name Blessing designs for her friends - what thoughtful gifts! Sorry it has taken me so long to get this to you. We didn't end up having the auction, like I had hoped, but I was able to get $150 for this for the orphans in Haiti. 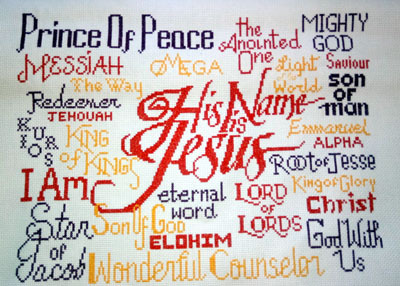 Thanks for allowing me to do this and I will send you a picture of the pattern that you made for me for the church as soon as it is done. 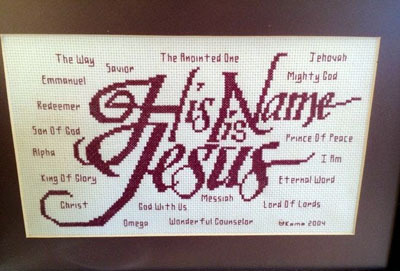 I just wanted to say a big thank you to you and to Diane Higdon who shared the cross stitch "His Name is Jesus". 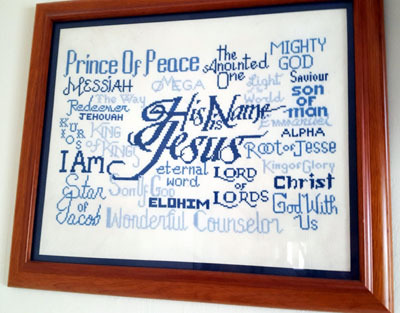 I have just completed it and had it framed for a friend for her 70th birthday and looks gorgeous. 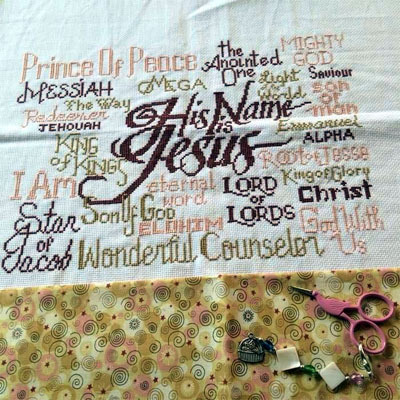 this morning i finished the pattern of "His Name is Jesus". When I saw it, I fell in love with it. I saw on your website the pattern stitched by another costumer in red and pink tones and I absolutely loved it because its so warm and gives that warm feeling of welcoming to my home. I recently got remarried and I want to put this pattern in my home entrance. Thank you for sharing it, its gorgeous. 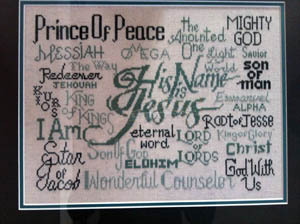 Here is a photo of the Names of Jesus cross stitch that I got from your website. Thank you so much for sharing it with me! I so enjoyed working on it! 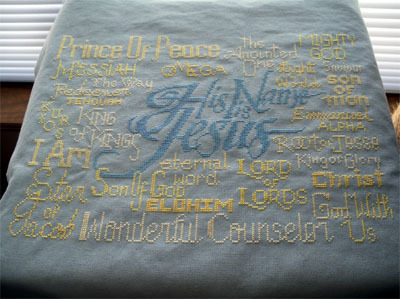 I added some gold thread throughout the ”Jesus” part. Keep up the good work on your website! 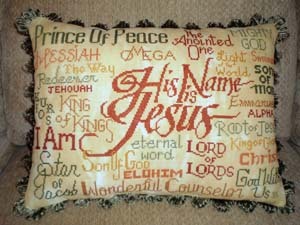 This time I made a pillow for my Associate Pastors wife. She loved it! I am having so much fun with this pattern. Thank you for making it available & free at that! I've made several of these for gifts but I believe the pillow colors were DMC 935, 918, 782. Should be burnt orange, gold, green. 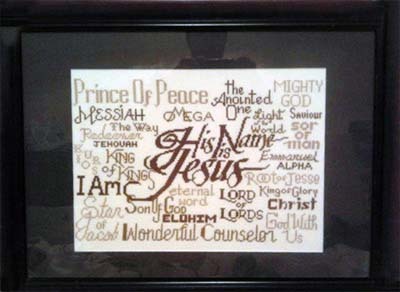 Here is a photo of my "His Name Is Jesus". Thank you for this free pattern. 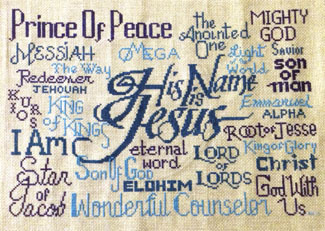 It was so easy and what a joy to stitch about Jesus!! My home is mainly in dark reds, blues and tan or golds. I can't wait to have it framed and enjoying it! I might just make many for gifts! This photo was sent in by Christine Basta. 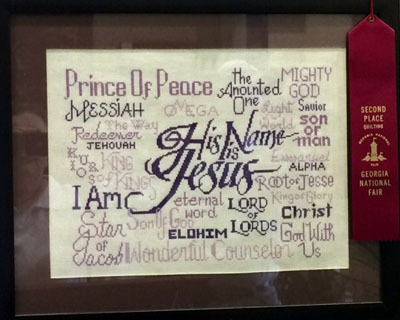 She stitched "His Name is Jesus" on 28 count linen, in multiple jewel tone colors. I can't believe how fast I am going on these! I just sat down for a bit tonight and already have the HIS NAME already done. I'm going to do the spanish one for my daughter, senior in high school is almost fluent. Will be studying this along with pre-med next yr in college! I also bought a brown linen with 26 different colors of the brown family. I'm saving this one for me and this colorway will go to two priests now. Will send you a pix on this. 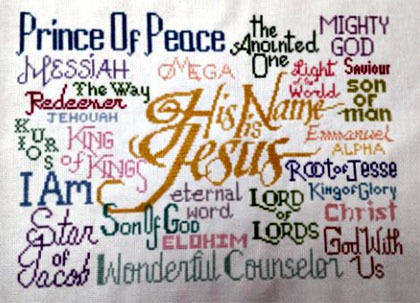 I have completed 'His Name is Jesus'. I like it in Olive Green because it reminds me of the Garden of Gethsemane. I just want to let you see what the finished project looks like in this color. 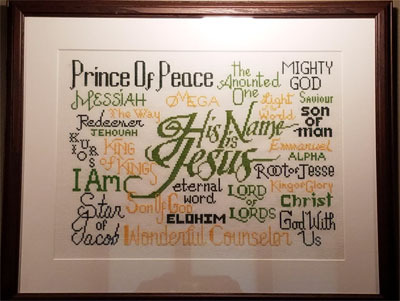 In March I want to display it in our church gallery. If I get requests for this pattern I'll pass on to them your website. This was my first cross stitch project in a long time! 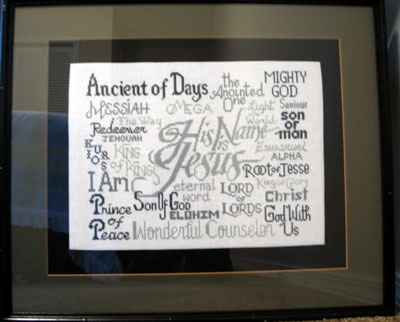 I loved thinking about word each word means to me as I was stitching. I'm working on a new one for my sister in law using metallic floss. I will send you that picture too when I'm finished. Thank you so much for sharing this with us! Thank you! I totally forgot to share this with you. I have so enjoyed this chart you so graciously shared for all for free. I made the one in greens for a dear friend in Oklahoma. We have never met but I love her dearly. 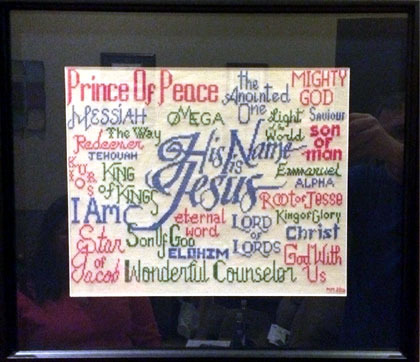 The one in red I made for our church. 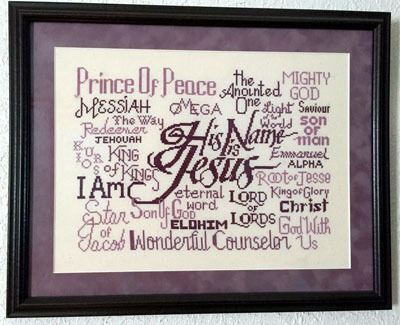 Next time I hope to make one to hang alongside another piece I made about going to church. I think they will look good together. god bless and huggles dear friend. Michelle - I know my Redeemer liveth! 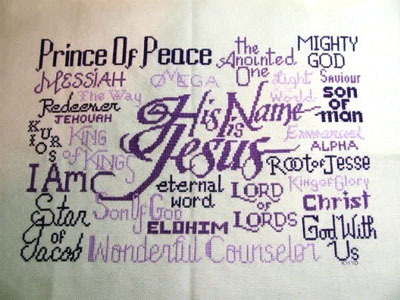 First, I want to tell you how much I have enjoyed the His Name is Jesus pattern! I've made it 6 times now. I've kept one, but give away 4. Each time, I'm not sure about the colors. As I stitch, I usually fall in love with it and have a new favorite! 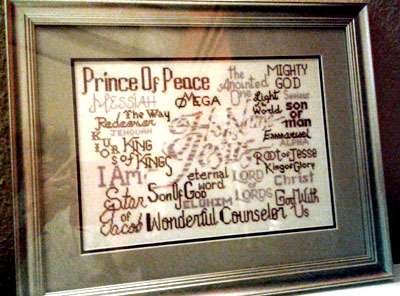 The last two were made as hostess gifts when we travel to Uganda for mission trips. The bishop's wife and our missionary were both blown away! 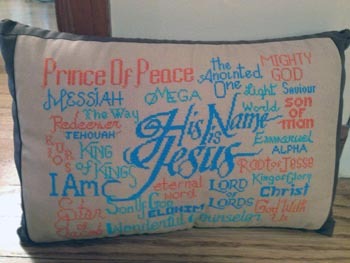 I made the pillow for the bishop's wife and the missionary wanted to finish her own. The dark blue is DMC 996. The lighter blue is DMC 3846. The orange is DMC 721. 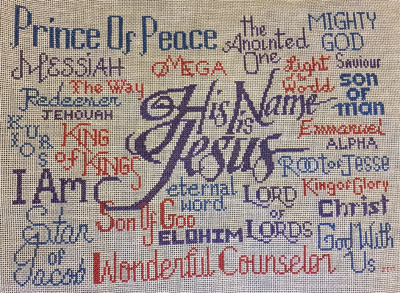 I stitched it on a Charles Craft beige Aida cloth. This photo was sent in by Jane Langfield. 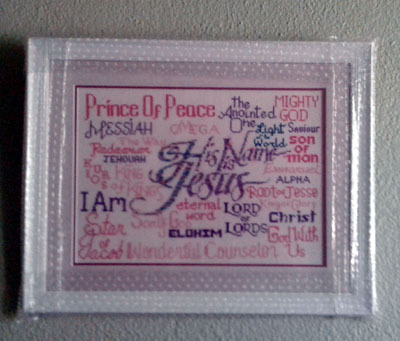 I am just about to start on my third one of these and thought you might be interested to see the first one I did as a leaving gift for my Pastor and his wife. I think they liked it but Lois broke down in tears when I gave it to them so difficult to tell! There are three things about this version which makes it slightly different. 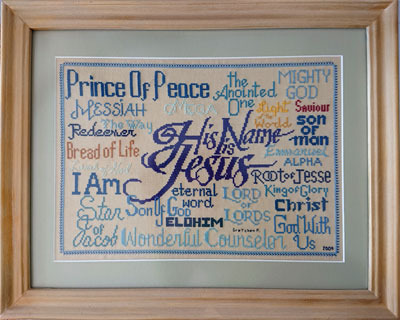 It is the UK English version (Counsellor rather than Counselor), it is stitched on 18ct vinyl weave which means that it is a perfect fit for an A4 frame and I used a gold filament twined with a dark gold (DMC 3822 I think) for the His Name wording which makes it sparkle. It looked fantastic as it caught the light but was definitely a labour (there goes the language issue again!!) of love as it took about twice as long as the tension in the two threads is different. I used DMC 3829 and DMC 727 for the other colours. As an aside, having more designs which fit into a standard A4 frame would be great. I'm off work at the moment and so on a limited budget and stitching gifts is great therapy but I often can't afford to get the end product professionally framed. 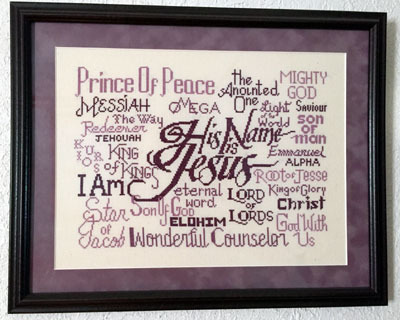 I was able to frame this at a fraction of the cost as the vinyl weave maintains its shape and so doesn't need stretching and I used a "frameless" frame or clip frame from IKEA. These are pictures of two cross stitch patterns that I have finished. 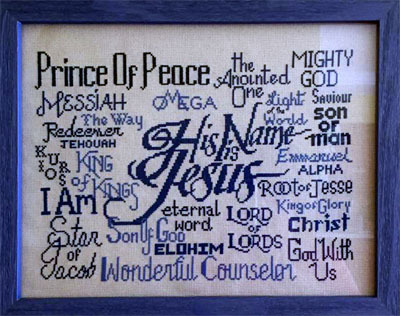 There are a few mistakes in His Name is Jesus, but I got everything in, and no one knows but you, me and God! 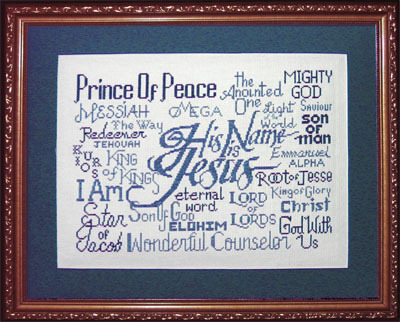 I am making another one of His Name is Jesus for our minister of music for Christmas. 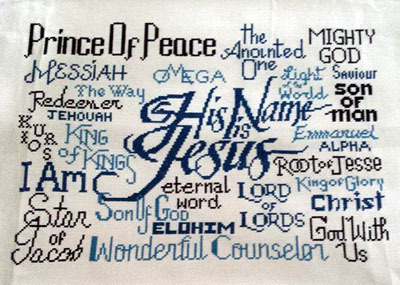 Our program is entitled “His Name is Called”, and any of those names would fit. This was made for our pastor at his 5 year anniversary pastoring our church. 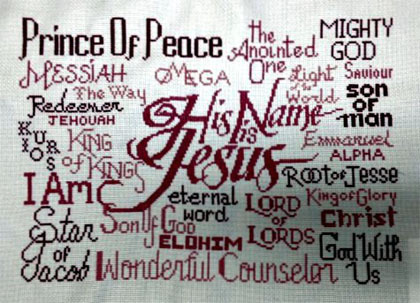 I haven't yet stitched the ABC's of Faith but have completed the names of Jesus and it turned out well. 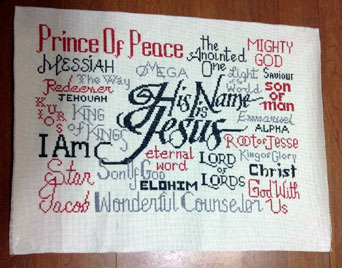 I really like the gospel stitchery. Thanks. Hi. 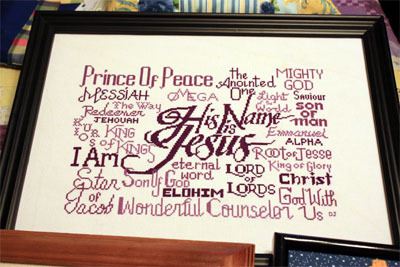 First I just wanted to let you know that I LOVE this pattern "His name is JESUS". I've used my copy so much that it is falling apart. I was wondering if you could send me another one. So I might have a new copy that isn't falling apart and ripping. Thank you. 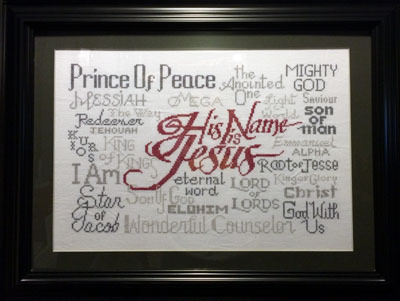 I am in my late 40's and have been cross-stitching since Jr. High school. I am a stroke survivor and cancer survivor. 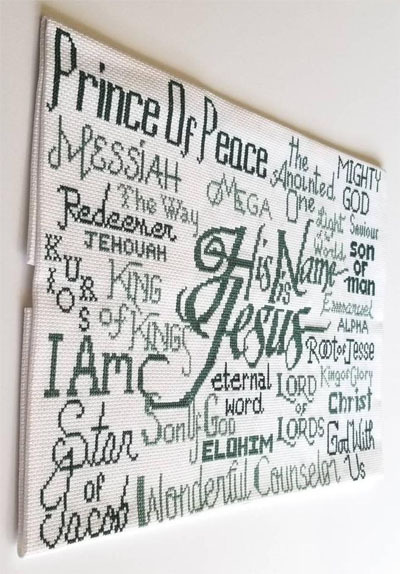 I use my time cross-stitching to pray for my 3 boys that are all in college, my husband who works away from home alot, and also those who are in need of prayer. Which is pretty much everyone I know! 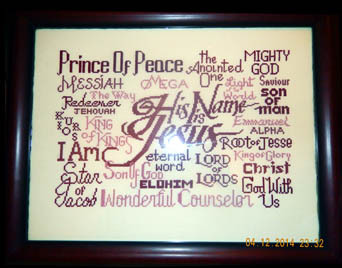 I got your design "His Name is Jesus" to do for my son that goes to college 15 hours from home. 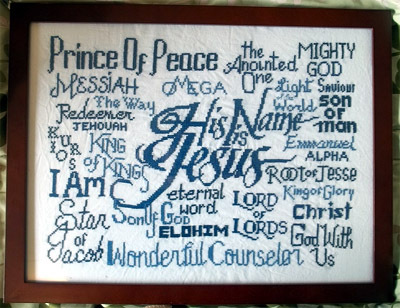 I want him to feel the power of the names that are on the pattern in reference to our Savior Jesus Christ and know that His power is ours when we just speak His name. I thank you for the website and plan to do many of your patterns! Since I have lost half the vision in both of my eyes from the stroke, I go a little slower but that just gives me more time to pray! It's been a blessing to work on this pattern. I'm doing the blue shades and also got green, and mauve to do a few more when I get the first one done. Hopefully by his birthday on Sept. 7th. 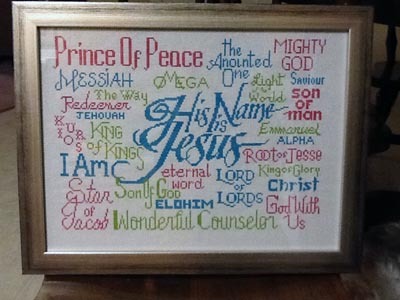 Due to a lack of funds after my husband finishing seminary, I am trying to make all of our Christmas gifts this year. I had just prayed for God to provide something special for me to make for my mother. This will be perfect in blues for her. Thank you so much for providing this ministry. 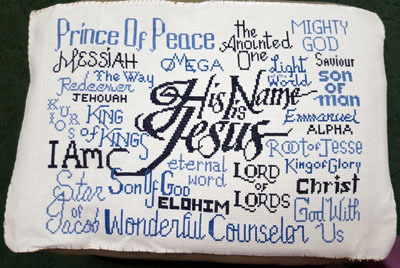 I do like to stitch w/the complete pattern in front of me ....many thanks for the special attention you have given your customers on this one.....God Bless you and have a great week. I love your website although this is the first time I've downloaded anything off of it. 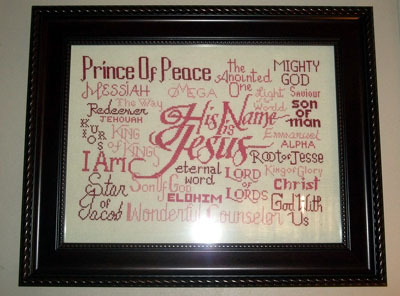 I am hoping to do this design in four different color schemes as Christmas presents for my children. Thanks for the free patterns. 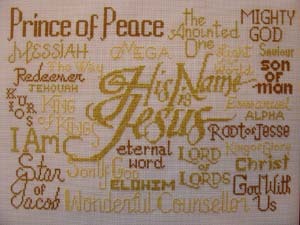 I have not done any cross stitch for a couple of years. 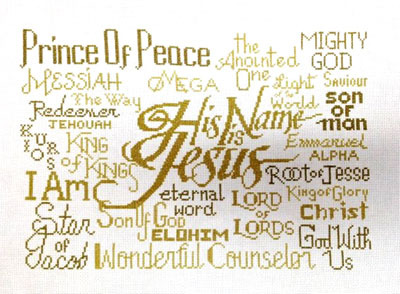 I downloaded the names of Jesus and I will pass it on. 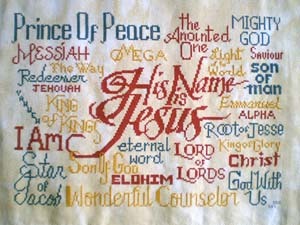 Hi...I just found your pattern "Jesus is His Name" and I am thrilled and anxious to get started. I want to do it in the blues like the picture. I just wanted to say thank you for the lovely free chart. It is very nice. I appreciate your offering it and may God reward you for the seed you have sewn. I LOVE your website and all the designs on it!! I was excited to find it. 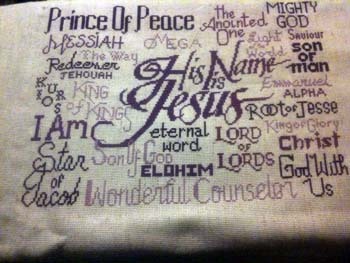 I made it there thru the 123 stitch website which I frequent when I get a chance!! 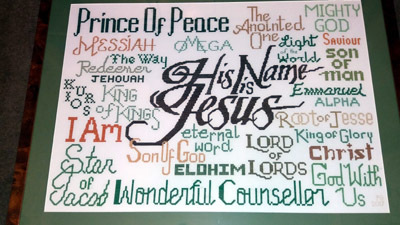 Thanks for writing!! It's exciting to meet you!!! I want to thank you for the update on this chart. I just finished one in the mauve color and I am starting one in the purple tones. I will also be doing one with dark green aida with gold tones to it. It will make it easier to follow the pattern now. 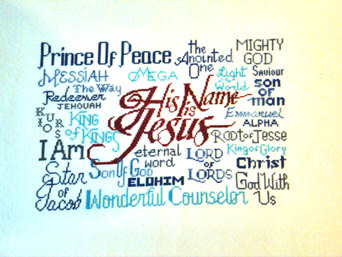 Thank you again for such a wonderful design. 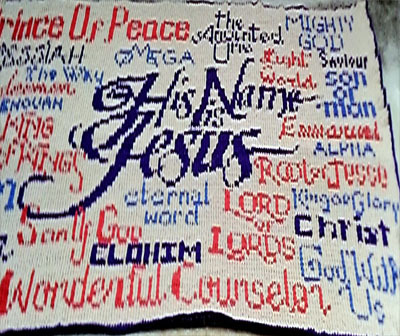 This afghan is going to be a gift for our Pastor. 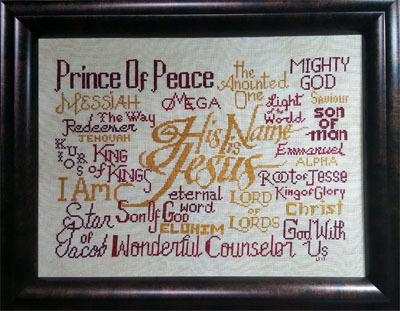 I was searching for an appropriate cross stitch pattern and fell in love with this one. but I'm sure that he is going to like it. I used a cluster stitch for each square to make it closer to the pattern.